The fall in temperature during the winter usually leads to increased pain and stiffness in your joints especially if you have a pre-existing orthopedic injury or arthritis. You might be tempted to limit your body movements and forego any type of physical activity during this time. However, inactivity contributes to weight gain, worsening joint pain, and winter blues. 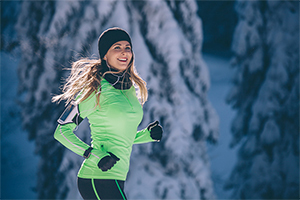 Exercise dressing during winters should comprise of essentially three layers. First wear a thin layer of synthetic material like polypropylene that keeps sweat away from your body. Avoid cotton as it prevents sweat from evaporating. Wear a second layer of wool for insulation. Wear a third layer of waterproof, breathable garment. This way of dressing helps you to remove clothes easily once you start sweating and put them back as required. When it is cold, blood flow is directly more to your body's core, leaving your feet, hands and head more susceptible to frostbite. Wear woolen head scarves, headband, hand gloves and socks to protect your ears, head, fingers and feet and keep them insulated. Heat also keeps joint pain under control. When you go for cycling or other winter sports use a helmet to prevent injuries due to falls. Wear goggles or dark glasses to protect your eyes against ice glare and snow. You may opt for winter sports like ice skating, skiing or snowboarding. If you prefer to be indoors, stick to activities like walking in the mall, shopping centers or your home, climbing stairs, yoga, aerobics, household activities like vacuuming, and stretching while watching TV to keep yourself active and flexible without catching cold. You can enroll for indoor swimming classes in your neighborhood. Swimming is a great exercise and particularly beneficial for people with arthritis pain and obesity. In addition to burning excess calories, swimming engages your joints and increases your range of motion which is helpful if you suffer from joint pain. Extreme cold and wind chills can make it unsafe to exercise outdoors despite warm clothing. The cold winds can penetrate your clothes and may cause frostbite. So, beware of the weather forecast before heading for outdoor activities. Don't let cold weather be your excuse, get moving and fight off those winter blues!